The aliens have already invaded in Team17’s Mugsters and now it falls to you to rescue the survivors while causing absolute mayhem for the invaders! 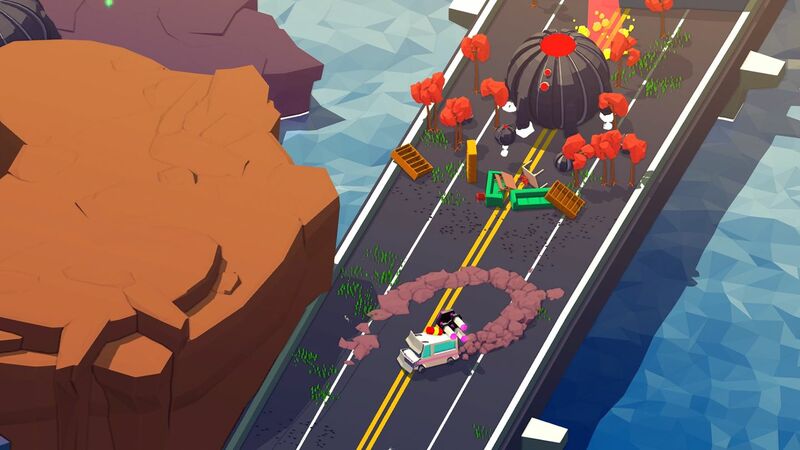 The latest in a string of games to come from Team17’s “Incubation” initiative, Mugsters is a physics-based, action puzzle game in which you must outsmart the alien pursuers by experimenting with all sorts of environmental, hazards, traps, vehicles and the odd exploding barrel all in the name of rescuing the last survivors of each island and bringing them safely home. Featuring bright and colourful sandbox levels, Mugsters plays out from a top-down perspective and gives you the tools and an arsenal of over 30 vehicles to tackle each level however you see fit. You’ll be facing off against UFO’s, aliens and even the odd wall on your way to saving all the humans. Just remember, it isn’t all about saving humanity, there are also collectibles and a huge variety of other objectives to complete on the way to saving the world. The game also includes a couch co-op campaign that sees you and a friend take on the invaders (and probably, accidentally each other) together as well as Time-trials that see you attempting to complete each level as quickly as possible in the name of leaderboard glory. You can grab it right now on Xbox One from the Xbox Store for just £9.99. It is also available on PS4, Nintendo Switch and PC. Make sure you keep an eye out for our review. Aliens have taken over the planet and enslaved humanity. Only you have the know-how to drive back the dastardly threat, free your fellow Earthlings and SAVE THE WORLD. Mugsters is a physics-based, supercharged, action-packed puzzler with sandbox levels where you must outrun, out-manoeuvre and outsmart your enemies by experimenting with different vehicles, environmental traps and explosives. Mugsters is focused on the players’ creativity. Break out the prisoners, collect the crystals and get the heck out of dodge any way you can! Key Features: • Fast Paced Action! – Tackle a variety of dangers across a series of ingenious levels. Watch out for alien abduction rays, rocket turrets and a myriad of traps whilst escaping the pesky invaders who are forever on your heels. • Physics! – Experiment with a physics-based, sandbox environment. Complete your objectives as you see fit, and throw in a few exploding barrels for good measure. • Vehicles! – With more than 30 types of vehicles at your disposal; you can ram, lance, shred and shoot your way to freedom as you sock it to the extraterrestrial terrors. • Puzzles! – It takes brains to survive these hostile islands. Use a mixture of explosives, traps and vehicles to save the humans, collect crystals and fly the hell out of there. Just try not to run yourself over! • Multiplayer! – Team up and take on this world-dominating menace with a friend. All the single campaign missions are fully remixed for full two-player local co-op action!